Number 152 features (drum roll, please) Lefty the Salesman! Here, he tries to sell letters to the adults. Plus, Big Bird and Grover learn about DANGER, the Count hires Ernie to answer his telephone, James Earl Jones says the alphabet, and many classic cartoons are included (Willie Wimple, Jazz Spies, Martian Beauty, G is for Giggle). Scene 3: Mr. Hooper is posting the daily specials on his new letter board, but he can’t find a C or a G to complete the words “cheeseburger” or “garden salad.” Lefty arrives and pitches his wares to Mr. Hooper. Lefty says that both letters will cost him a quarter, which Mr. Hooper gives to him. To show his gratitude, Mr. Hooper also gives Lefty a cheeseburger and a garden salad on the house. Muppets: Bert notices that Ernie is taking glasses of water out of the apartment. When Bert presses him for an explanation, Ernie says that the faucet broke, so he’s bailing water before the apartment floods…but unfortunately he’s too late. Muppets: Waiter Grover serves a sandwich to Mr. Johnson, but Mr. Johnson tells him that it doesn’t match the picture on the menu. When Grover finally gets it right, Mr. Johnson leaves because his lunch break is over. Grover throws a fit in the kitchen. Muppets: Ernie makes a painting of Bert, but adds long hair, a beard, and thick glasses to the portrait. Bert is angry until Ernie promises to make the painting look like Bert again…by putting a wig, fake beard, and glasses on his roommate! Scene 6: Oscar has a DANGER sign outside his trashcan. Grover asks what this means, so Oscar explains that “danger” means to be careful and watch out. Grover wonders why he should be careful, and Oscar tells him that he’s going to play tag. Grover: “Oscar, that is silly! Tag is not a dangerous game!” Oscar: “Oh yeah? Well I’m playing tag with my pet rhinoceroses! Tell that to them!” As the game begins, the street starts shaking, scaring Grover out of his mind. Scene 7: Big Bird hobbles down the street, wrapped in bandages. Mr. Hooper, Bob, and Susan stare in disbelief and ask what happened. Big Bird: “Today, I learned what the word DANGER means…” The adults help Big Bird back to his nest as Grover announces the sponsors. SS sign still: Susan and Bob. CTW sign still: Maria. I think Lefty should announce the sponsors here instead of Grover. Number 153 features Oscar, Maria, Big Bird, Snuffy, Gordon, Bob, and Olivia. Plus, Don Music and Kermit rewrite a beloved children's song, Grover talks about the letter R, and Ernie irritates Bert by holding a banana in his ear. Muppets: Ernie goes overboard while preparing a trip to the library. After deciding to bring a plethora of items in case of rain, he drags Bert along so that he won’t be alone if he’s stranded. Scene 2: Maria shows the viewer her new hat and wants to show it to her friends. But she doesn’t get the response she wants from Gordon, Olivia, or Bob. Scene 3: Maria sits on the steps, feeling down. Oscar expresses an interest in her hat, but only if it’s crumpled up and covered with chocolate syrup and bits of newspaper. As Maria dirties up the hat, Oscar quietly ducks into his trashcan. Scene 5: The Count and the kids count hats and sort them by color. Scene 6: Big Bird has a cold, and Olivia and Gordon are taking care of him. Big Bird is sad because he has to call off his playdate with Mr. Snuffleupagus. The adults reiterate that Snuffy is imaginary, and they suggest to Big Bird that he should get some rest. After they leave, Snuffy shows up after all. He has a cold too, so he and Big Bird can still play together! Scene 7: Big Bird and Snuffy play card games, still feeling under the weather but happy with each other’s company. Maria announces the sponsors. SS sign still: Susan. CTW sign still: Gordon. Number 154 features Oscar, Herry, Biff and Sully, and a host of others. Plus, Ernie sings a lullaby and the Anything Muppets act out the story of "The Girl, the Tree, and the Terrible Troll." Scene 2: Herry Monster tries to attract customers for his new gym. Gordon and Luis arrive and Herry convinces them to do some bench presses. Both guys manage to lift the weights, but Herry outdoes them by lifting the whole bench! Cartoon: Here comes the bus! Muppets: At night, Ernie sings himself a lullaby to fall asleep. Bert asks him to sing quieter and quieter, until he can barely be heard…which then keeps Bert from falling asleep. Ernie asks Bert that if he’s singing so quietly that he can’t hear him, then why isn’t he asleep yet? Scene 3: Herry and the kids sort barbells by size. Scene 4: Biff and Sully are assembling furniture for Susan and Gordon. Biff is confused by the visual instructions detailing how to put the table and chairs together. Gordon points out that he’s holding the paper upside-down; however, Biff insists that the instructions are wrong and continues his work. Scene 5: Biff shows off his handiwork to Gordon and Susan: two upside-down chairs and an upside-down table! Biff: “Y’know, something about this doesn’t seem right…why would youse two want an upside-down table and chairs? Why would anybody want that?” While Biff ponders this, Sully and the adults flip the table and chairs over so that they now have a normal set of furniture. Scene 7: Big Bird and the kids play a game of “Giant Steps” as Susan and Gordon announce the sponsors. SS sign still: Kermit and a kid. CTW sign still: Maria. Number 155 features Cookie Monster, Grover, Big Bird, and several others. Plus, Roosevelt Franklin recites his name and a Japanese Muppet tells an ancient story about four hidden dragons! Scene 1: Cookie Monster (clad in a shirt collar and tie) welcomes the viewer to his new talk show, aptly titled “Cookie!” His first guest is Sesame Street’s second-leading specialist in cookies, Mr. Hooper! Cookie asks Mr. Hooper to explain to the viewers what a cookie is, and how it’s made. After Mr. Hooper’s brief but astute lecture, Cookie Monster expresses his feelings: “What invaluable knowledge! This high-quality programming, huh?” He offers Mr. Hooper half a cookie…and takes the other half for himself! Muppets: Ernie finds an egg, but doesn’t know what to do with it. After pestering Bert for an answer, Bert says to “just drop it” and Ernie drops it right on the floor! Scene 3: Cookie Monster presents the letters H and Q. Herry Monster passes by, and Cookie asks him to name some H and Q words with him. After naming “hat,” “house,” “Herry,” “quilt,” and “queen,” Cookie Monster comments that the letter H is nice, but the letter Q looks a lot more like a cookie. After he eats the Q, he is still hungry so he and Herry eat the letter H together! Scene 5: Big Bird and Grover continue on their space quest and “meet” Susan, who is reading a book. The “aliens” want to know what a book is, so Susan shows them its pages, and mentions that all the pages have words on them. The “aliens” start reading and get so engrossed that they keep Susan from reading her own book! Scene 6: Big Bird and Grover see SAM the Robot and attempt to “communicate” with him. SAM is perplexed by their behavior until they tell him that they are only pretending. Scene 7: Big Bird and Grover bid farewell to David, Susan, Bob, and Mr. Hooper. After they leave on their imaginary spaceship, the adults share a laugh as Cookie Monster announces the sponsors. SS sign still: Oscar. CTW sign still: Maria. Number 156 features Big Bird, Snuffy, Oscar, and the majority of the adult cast. Plus, Kermit interviews characters from "Hey Diddle Diddle" and Ernie makes a soda for Bert. Scene 1: Maria is overwhelmed with work at the Fix-It Shop. Luis is at the hardware store, and she has to fix several items by herself. David rushes in to ask her something, but Maria snaps at him and tells him not to bother her, without letting him get a word in edgewise. David finally shouts at Maria for not letting him speak. When they both calm down, David reveals that he bought flowers for her. Maria accepts them and they share a kiss. Cartoon: Clouds blow things – FFFFFFF! Scene 2: Big Bird and Mr. Snuffleupagus get into a heated argument over whether to play jacks or go-fish. Big Bird recognizes that he’s angry and calms himself down by counting to 10. Then he encourages Snuffy to do the same. Scene 3: After counting to 10, Big Bird and Snuffy feel better. They decide to take turns by playing jacks first and go-fish second. Muppets: At Hooper’s Store, Ernie makes a soda for Bert, but adds extra ingredients to it. Bert no longer wants the soda, but it’s perfect for Ernie! Cartoon: A weary traveler asks a wise man to show “here” and “there.” The guru does so by throwing his furniture off a ledge. Scene 4: Mr. Hooper asks Gordon if he can take some boxes of groceries and put them next to the other boxes outside. Gordon agrees, and Mr. Hooper leaves to pick up a delivery. When Gordon takes the boxes outside, he discovers that there are two stacks of boxes. One stack is in front of the newsstand and the other is next to the wastebasket, so he doesn’t know where his boxes should go. Gordon decides to put them next to the wastebasket, and he goes back into the store. 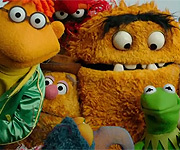 Oscar observes all this and chuckles…because Gordon just put Mr. Hooper’s boxes by the wastebasket for trash collection! Scene 5: The garbage truck arrives and takes the boxes. Gordon reads the newspaper, unaware of what’s happening. A minute later, Mr. Hooper comes in and asks Gordon where the boxes are. Gordon explains that he left them by the other stack of boxes by the wastebasket...but now there are no boxes left. Mr. Hooper and Gordon realize that the garbage collectors must have taken them! Gordon apologizes for the mistake, but Mr. Hooper admits that he wasn’t clear enough. They decide to go back to the store and get some new groceries. Scene 6: David helps Maria with her work in the Fix-It Shop; Gordon and Mr. Hooper return with their groceries; and Snuffy and Big Bird play together harmoniously. Oscar announces the sponsors. SS sign still: Bob. CTW sign still: Susan. Number 157 features Oscar, Big Bird, Susan, Bob, Mr. Hooper, Buffy, and Biff and Sully. Plus, the Count sings "Count Up to Nine" and Ray Charles stops by the Street to jam with Bert and Ernie! Scene 1: Big Bird observes the kids as they ride tricycles around the arbor area. Big Bird tells Bob that he’d like to ride a tricycle, but Bob isn’t sure if he’s ready. Big Bird insists until Bob agrees to spot him. Big Bird borrows one girl’s tricycle, and as Bob walks next to him, Big Bird successfully rides the tricycle! But he tells Bob one thing he’s having trouble with: stopping! He rolls away and crashes off-screen. Scene 2: Bob and Susan ask the kids about ways to get around town…they can walk, use bicycles, drive cars, or take the train. Scene 3: Oscar tells Buffy that he feels bored because he’s run out of things to do. He’s collected lots of trash, insulted everyone on Sesame Street, and “eaten more sauerkraut-and-prune ice cream than a Grouch’s heart could desire!” Buffy asks him if he’s ever made home movies, and suggests that he try it out. Oscar rummages in his can for a video camera and pulls out a battered device. Buffy says that it is in no shape for filming home movies, which means it’s perfect for Oscar to use! Scene 4: Susan comes out of her apartment with a bag of trash for Oscar. Oscar tells Susan to take the trash bag back inside, and to come outside again so that he can film this moment. Susan does so, and then Oscar instructs her to go back inside again. Eventually, Oscar reveals that he’s filming this moment AND tricking Susan into walking back and forth from her apartment! When Oscar finally asks for the trash, Susan tosses the bag at him before storming off. Muppets: Cookie Monster and Herry Monster fight over a bicycle. Kermit tells them to share it, which they do…by eating it piece by piece! Muppets: Lefty and his boss steal the Golden AN. The boss tells Lefty the plan, but once he leaves, Lefty has trouble remembering the plan. As Lefty recites the plan to himself, a policeman named Stan discovers him and arrests him. Scene 6: Biff and Sully arrive to do some construction work. When they start jackhammering, Oscar pops up, delighted by their presence. Mr. Hooper, Bob, Buffy, and Susan complain about the noise, but Oscar wants the hardhats to keep working so that he can film them while they’re using their jackhammers! Scene 7: Oscar assembles Bob, Susan, Mr. Hooper, Buffy, and the kids to watch his home movies. First, he filmed Susan giving him some trash. Next, Oscar filmed himself drinking a coconut and anchovy smoothie at Hooper’s Store. Finally, he filmed Biff and Sully using their jackhammers. Afterwards, everyone says that they found the movies interesting, entertaining, fun, and nice; which offends Oscar. Big Bird announces the sponsors. SS sign still: Susan. CTW sign still: Gordon. Number 158 features Big Bird, Oscar, Mr. Hooper, Gordon, and Susan! Plus, Cookie Monster sings a disco song, Kermit encounters Grover the salesman, and Bert advises Ernie not to eat cookies in bed. Scene 1/Insert: Oscar asks two jugglers (Michael and Paul) to set up his bowling alley, but instead they juggle the pins. Scene 2: Oscar asks the kids to show “next to” by placing cans and bottles side by side. Then he demonstrates “away from” by tossing every can and bottle into his trashcan! Scene 4: Mr. Hooper is writing down the special of the day (pastrami on rye), but he can’t think of what he wants to add as a dessert. Big Bird arrives to help and offers words like “fly,” sky,” and “tie,” all of which rhyme with “rye.” Mr. Hooper commends Big Bird for his rhymes, but none of those words can be part of the special of the day. Big Bird: “Say Mr. Dooper, I’m hungry. Do you have any birdseed pie?” Suddenly, the light bulb goes off and Mr. Hooper adds the word “pie” to his special of the day! He thanks Big Bird, who is rather confused (and still hungry). Cartoon: At night, a group of mice are scared of a monster. They describe its features until the monster appears as an elephant that is more scared of the mice! Cartoon: A man tries to guess where a squeaking noise is coming from. It turns out to be from a giant’s shoes. Muppets: Ernie is sad because he can’t play baseball in the rain. Bert tells him to imagines playing baseball instead. Number 159 features Big Bird, Oscar, Rodeo Rosie, Bob, and Luis! Plus, Judy Collins sings with a group of Muppet fishermen and Guy Smiley hosts the "Mystery Mix-Up Game." Scene 1: Bob plays a singing echo game with Big Bird and the kids. Scene 2: Rodeo Rosie goes to the Fix-It Shop to get her lasso fixed. Luis sees that the rope has snapped, so he ties a knot to fix it. Rodeo Rosie is grateful, and says she has a few more lassoes for him to fix…as she pulls out a large burlap sack full of lassoes! Scene 3: Rodeo Rosie shows off her lasso tricks to Luis, Big Bird, and the kids. She lassoes the fire hydrant, a wooden box, and finally Bob! Unfortunately, Rodeo Rosie lassoes Bob as he’s walking into his apartment with his arms full of groceries. Cartoon: Tiger likes going to school! Scene 4: Oscar has set up a fortune-telling booth. Bob passes by and Oscar convinces him to get his fortune told for one dime. After Bob reluctantly gives him the dime, Oscar looks into his cracked and stained crystal ball (“It’s as clear as mud, Bob!”) and predicts that Bob will “experience a most unfortunate event.” Bob protests this, so Oscar tells him to look into the crystal ball for himself. When Bob does it, a puff of white powder blows up in his face. Muppets: Bert tries to write a letter, but Ernie turns on his electric fan and blows everything around the apartment. Bert yells at Ernie and says he is “hot and bothered,” and Ernie has just the thing for that: more cool air! Scene 5: The Count stops by Oscar’s fortune-telling booth and asks for his fortune. Oscar looks into his crystal ball and tells the Count, “Don’t count on anything good happening today.” The Count asks for his fortune again, so Oscar repeats the process. The Count does this over and over just to count how many times Oscar tells his fortune! Scene 6: Bob and Luis give piggyback rides for the kids as Rodeo Rosie announces the sponsors. SS sign still: David. CTW sign still: Bob. Number 160 features Big Bird as he receives a visit from his uncle Edgar (never created for the show as far as I know). Plus, the Martians discover a telephone, Prairie Dawn puts on a seasons pageant, and Cookie Monster portrays the Great Cookie Thief! Scene 1/Insert: Paul Simon sings, “Me and Julio Down by the Schoolyard” as the kids sing and dance on Sesame Street. Scene 2: Olivia, Maria, and Bob point out a giant sign on Big Bird’s doors that reads, “WELCOME UNCLE EDGAR.” Big Bird explains that his uncle Edgar is visiting from the countryside. He invites them into his nest, where a scarecrow, piles of hay, and several Muppet animals are situated. Big Bird wants to make his uncle feel “at home,” but Maria thinks that Uncle Edgar might want to experience the city as well. A knock on the door is heard, and Uncle Edgar (a Big Bird-lookalike with a goatee, straw hat, and overalls, played by Jerry Nelson) arrives and meets the adults. Cartoon: Capital I, he’s quite a guy! Scene 4: The store counter is littered with empty glasses, as Uncle Edgar keeps polishing off birdseed milkshakes. Mr. Hooper and Big Bird count the glasses, and there are six in total. Scene 5: Big Bird takes Uncle Edgar to the Fix-It Shop, where they overhear Maria speaking Spanish on the telephone. Uncle Edgar has never heard anyone speak like that before, so Big Bird and Maria explain what the Spanish language is. Scene 6: In Big Bird’s nest area, Big Bird, Uncle Edgar, and the kids talk about living in the city and the country. Scene 7: At night, Big Bird and Uncle Edgar ask each other if they’re prepared to go to sleep. Edgar has his pillow and a glass of water, while Big Bird has a blanket and teddy bear. After saying goodnight, Big Bird falls asleep and begins to snore. Uncle Edgar tells the viewer that he’s extra prepared with a pair of earmuffs to drown out the snoring! As Uncle Edgar dozes off, Olivia announces the sponsors as the “nighttime” Sesame Street theme plays. SS sign still: Linda. CTW sign still: Luis. Number 161 features Oscar, Big Bird, the Amazing Mumford, David, Mr. Hooper, and Luis. Plus, Ernie keeps Bert up with loud sounds, Cookie Monster helps Kermit talk about weather, and Don Music rewrites "Yankee Doodle." Scene 1: Mr. Hooper helps Big Bird shows some and more by pouring birdseed into bowls. But Big Bird knocks the bag of birdseed over, which means that now most of birdseed is on the ground. Muppets: Mr. Johnson wants to order food at a restaurant, but Grover tells him that they only have some items on the menu. It turns out that milk is the only item available, but there are no clean glasses either! Muppets: Ernie exercises to a radio program and gets Bert to join him. Bert enjoys it so much that he doesn’t realize that the Pigeon News is coming on. Scene 4: In the midst of the rainstorm, Oscar has opened an ice cream stand and is waiting for customers. Luis and Mr. Hooper are surprised that Oscar is serving normal ice cream flavors like vanilla, chocolate, pistachio, and strawberry. However, when Oscar offers toppings like pickles, anchovies, chopped liverwurst, and diced jalapeños, both men lose their appetites. Muppets: At night, Ernie and Bert hear the faucet dripping. Ernie tries to drown it out by turning on several loud items, which keeps Bert awake. Scene 6: David passes by Oscar’s ice cream stand. When Oscar offers him some ice cream, David laughs at the notion: “Are you kidding, Oscar? Nobody in their right mind wants to eat ice cream in the rain! Nobody in the whole world wants ice cream with pickles and anchovies on it!” However, he is proven wrong when two Grouches approach the stand, asking for ice cream with extra pickles and anchovies. Cartoon: Three lines struggle to reach the top of the screen by themselves. They cooperate by combining their respective lengths. Scene 7: The rain stops, and the sun comes out. Oscar is disappointed until he sees that his ice cream is melting. He tries to sell his soupy ice cream, but without success (David, Luis, and the Count all pass). Oscar decides to save the melted ice cream for his supper: “It’ll taste great on top of raw broccoli and mashed potatoes.” David announces the sponsors. SS sign still: Susan. CTW sign still: Gordon. Jerry Nelson and Bob Payne. 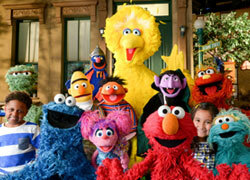 Number 162 features Big Bird, Oscar, Grover, Cookie Monster, Maria, Luis, and Mr. Hooper! Plus, Ernie and Bert fight over the TV chair and Little Jerry sings about feeling proud. Scene 1: The cast shows off their favorite “P” objects: Mr. Hooper holds a pear, Cookie Monster eats a peach pie, Luis uses a pair of pliers, and Maria cuddles a live puppy. Finally, Big Bird fluffs his pillow and takes a nap. Scene 2: The cast shows off their favorite “V” objects: Mr. Hooper holds a box full of vegetables, Luis uses a vaccuum cleaner to clean his shop, and Grover holds a bouquet of violets. Finally, Oscar presents a tiny volcano that doesn’t erupt. When Maria looks at it, she gets sprayed with a jet of chocolate sauce. Scene 3: Big Bird is listening to the sound of birds chirping in the trees, and he wonders what it would be like if everybody tweeted instead of talking. The scene fades into a sequence where Big Bird can talk normally, but everybody else (Mr. Hooper, Luis, Maria, and Grover) chirps and tweets. He realizes that nobody would be able to understand each other. Insert: Prince Charming greets Bob and tells him he’s looking for a girl he met last night. He describes what she’s wearing, but Bob corrects him about what body parts they go on. The girl shows up wearing clothes and accessories on the wrong parts of her body, and the Prince declares that he’s found his love. Scene 4: Luis finishes reading “Jack and the Beanstalk” to a group of kids when Oscar comments about his favorite character: the giant who antagonizes Jack! He imagines what it would be like to live as a grumpy giant (complete with a giant trashcan). Cartoon: What if we celebrated Valentine’s Day with chickens instead of hearts? Scene 5: Grover asks Maria and the kids what “AMOR” means. They demonstrate by giving him hugs and kisses, and after a few silly guesses Grover finally guesses that it means “love” in Spanish. Scene 6: Maria asks Oscar to guess what “AMOR” means. Oscar is suspicious, but plays along. After he gives some wrong guesses, Maria demonstrates with a hug and a kiss, and reveals that it means “love” in Spanish. Oscar furiously tells her off, and Maria skips away gleefully. Cookie Monster announces the sponsors. SS sign still: the Count. CTW sign still: Oscar.